The 2002 Cheltenham Gold Cup, sponsored by the Tote, featured 18 runners – the biggest field since Silver Buck beat 21 rivals in 1982 – and was the first to be run for two years, after an outbreak of foot-and-mouth required the abandonment of the Cheltenham Festival in 2001. The defending champion, Looks Like Trouble, ridden by Richard Johnson, was sent off 9/2 favourite, ahead of Bacchanal, ridden by Mick Fitzgerald, at 6/1 and Best Mate, ridden by Jim Culloty, at 7/1 in an open betting heat. Looks Like Trouble and 1999 winner, See More Business showed their rivals the way until the third last fence, at which point See More Business took a definite advantage. 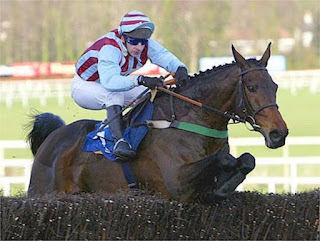 Paul Nicholls’ 12-year-old was challenged by Commanche Court, ridden by Ruby Walsh, on the home turn, but Best Mate – who’d travelled well into the race coming down the hill – took over, narrowly, on the run to the last fence and ran on well up the hill to win by 1¾ lengths. Commanche Court could make no impression close home, but finished second, with the veteran See More Business a gallant third, a further 8 lengths away. Winning jockey Jim Culloty was equally delighted, saying of Best Mate, “He’s got the engine. I was always cruising. I got squeezed a little bit as Joe’s [See More Business, ridden by Joe Tizzard] came across me, but I wasn’t panicking because I didn’t want to get there too soon anyway.